Grab a bite to eat at the Colette, a restaurant where you can take in the garden view and dine alfresco. Or stay in and take advantage of the 24-hour room service. Unwind at the end of the day with a drink at the bar/lounge or the poolside bar. Buffet breakfasts are available daily from 7:30 AM to 10:30 AM for a fee. At Benkirai Hotel, enjoy a satisfying meal at the restaurant. Wrap up your day with a drink at the poolside bar. Breakfast is available daily for a fee. Make yourself at home in one of the 28 air-conditioned rooms featuring minibars and flat-screen televisions. Complimentary wireless Internet access keeps you connected, and satellite programming is available for your entertainment. Private bathrooms with shower/tub combinations feature complimentary toiletries and hair dryers. Conveniences include safes and desks, as well as phones with free local calls. Located in Saint-Tropez, Château de la Messardière is by the sea, within a 10-minute drive of Pampelonne Beach and Place des Lices. This 5-star palace is 2.1 mi (3.4 km) from Saint Tropez Citadel and 2.2 mi (3.6 km) from Port of Saint Tropez. Enjoy Mediterranean cuisine at Le Belrose, one of the hotel's 2 restaurants, or stay in and take advantage of the 24-hour room service. Unwind at the end of the day with a drink at the bar/lounge or the poolside bar. Buffet breakfasts are available daily from 7 AM to 10:30 AM for a fee. With a stay at Hôtel Restaurant Le Yaca, you'll be centrally located in Saint-Tropez, within a 15-minute drive of Pampelonne Beach and Saint Tropez Citadel. This 5-star hotel is 23.3 mi (37.5 km) from Frejus Beach and 24.1 mi (38.7 km) from Saint-Raphael Beach. Offering an on-site bar, Hôtel Playa is located in Saint-Tropez, just 150 metres from the marina. Free WiFi access is available. Other facilities include a shared lounge. Decorated in pastel tones, each room at Hôtel Playa has a flat-screen TV and air conditioning. Featuring a shower, each private bathroom also comes with a hairdryer and free toiletries. Breakfast is served each morning in the communal lounge, with an additional cost. Bars and restaurants can be found within walking distance from the hotel. Public parking is possible nearby and Côte d'Azur Airport is 63 km from the hotel. Satisfy your appetite for lunch or dinner at Restaurant La Figuiere, a restaurant which specializes in regional cuisine, or stay in and take advantage of the room service (during limited hours). Wrap up your day with a drink at the bar/lounge. Full breakfasts are available for a fee. Relax and unwind with massages and body treatments. Additional features at this hotel include complimentary wireless Internet access, concierge services, and babysitting/childcare (surcharge). Getting to nearby attractions is a breeze with the complimentary area shuttle. Make yourself at home in one of the 27 air-conditioned rooms featuring minibars and flat-screen televisions. Digital television is provided for your entertainment. Private bathrooms with bathtubs or showers feature rainfall showerheads and designer toiletries. Conveniences include phones, as well as safes and desks. Make yourself at home in one of the 90 individually decorated guestrooms, featuring minibars and LCD televisions. Complimentary wireless Internet access keeps you connected, and satellite programming is available for your entertainment. Bathrooms have complimentary toiletries and hair dryers. Conveniences include phones, as well as safes and complimentary newspapers. Enjoy Peruvian cuisine at Le 1K Restaurant, one of the hotel's 2 restaurants, or stay in and take advantage of the 24-hour room service. Unwind at the end of the day with a drink at the bar/lounge or the poolside bar. Buffet breakfasts are available daily from 7 AM to 11 AM for a fee. If you're after glitz and glamour, exotic landscapes, pristine sandy beaches, and exceptional cuisine, you don't have to look any further than Saint Tropez. Long a Mediterranean haven for international movie stars, this charismatic resort is one of the most prestigious holiday destinations in the world, and is revered for its high-end shops and exclusive nightlife venues. Originally a quiet fishing settlement, Saint Tropez rose to global prominence after it became associated with the world-renowned French actress Brigitte Bardot, who moved to the area in 1958. The resort, which benefits from an average of more than 2,700 sunshine hours each year, was already home to several grand villas by the Roman period, and was, for many centuries, a strategic military defence. Today, it forms part of the French Riviera, which extend more than 100km northeastwards to the picturesque coastal town of Menton near the Italian border. You might want to visit La Maison de Papillons, which provides a fascinating insight into the world of exotic butterflies and showcases many international specimens. Meanwhile, in the historic citadel (Montée de la Citadelle), the Maritime Museum explores the profound maritime history of the French Riviera and is open to the public regularly. The Musée de l'Annonciade, an acclaimed boutique art museum, exhibits many remarkable paintings of the Saint Tropez and the rest of the Cote d'Azur from celebrated artists such as Matisse and Bonnard. Another site worth visiting is the Eglise Notre Dame de l'Assomptions, which was designed in the distinctive Baroque style and contains the bus of the saint who founded Saint Tropez, St Torpes. The largest and most famous beach in Saint Tropez is the Pampelonne beach, which has been the place to be seen since the mid-20th century and is a great location for celebrity spotting. The Plage des Salins is another scenic stretch of sand that is relatively secluded and can be reached via the Sentier du Littoral walk, while the Plage de la Bouillabaisse offers superb panoramic views of the Maures mountains. There are several other smaller north-facing coves in Saint Tropez, although these can become rather busy during the summer. Thanks to its cosmopolitan atmosphere, Saint Tropez has a diverse restaurant scene with a wide variety of cuisines to suit different tastes. For some outstanding French cuisine, try Restaurant Le G', Au Vieux Gassin or Le Pescadou, or choose Saveur Sincres for other delightful, refined Mediterranean recipes. For some fabulous Moroccan flavours, head to L'Adresse Marocaine, or choose Gandhi for some divine Indian cuisine. 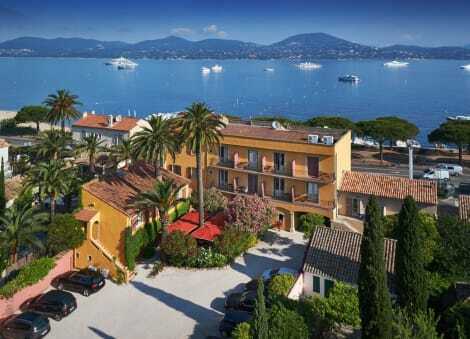 There's no shortage of glamorous Saint Tropez hotels, but if you're looking for somewhere with extraordinary sea views and deluxe amenities, you could book a stay at the Villa Belrose Hotel. 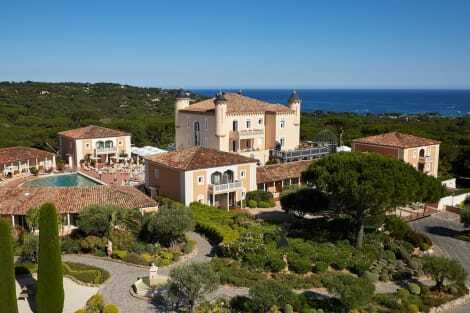 Another venue offering world-class hospitality includes the Chateau De La Messardiere, while the Hotel La Residence de la Pinede and Hotel Sezz Saint Tropez are other excellent options.